We live in a part of the country with long, hot summers and very short winters. Household comfort is a vital part of life here, especially as winter turns to spring and the temperatures begin rising again. Most homes in the area rely on traditional heating and air conditioning systems: usually centralized systems that heat or cool the air in a single location, then blow it through the home with a series of ducts. The system worse quite well, but it’s not the only kind of HVAC system out there. Depending upon the needs of your home, another one might be able to do the job much more effectively. Now is an excellent time to consider replacing an old HVAC system, when the weather is mild and you can go without it in the time it takes to install one. You may want to consider an alternative model like the ones detailed below. Should I Consider a Ductless Mini-Split System? If you’re in the market for a new air conditioning system, we know that you have to move quickly. The heat here in Walker, LA is brutal this time of year, and a replacement air conditioner may be your top priority. Depending upon your home, you might want to consider a ductless mini-split system in lieu of a traditional centralized air conditioning system. Why? There are a number of good reasons, though as always, the final decision is yours. Here’s a few facts to help you out. Posted in Air Conditioning | Comments Off on Should I Consider a Ductless Mini-Split System? Are Ductless Mini-Split Systems Right for Me? Here in Hammond, LA, we have a large number of different types of homes, each with a different type of air conditioning need. In some cases, a ductless mini-split system may be right for you. These units divide your home into individual sections, each one cooled by its own separate air conditioning unit. The system allows you to adjust the temperature in each room separately, or even turn off the air in rooms that no one is using. Ductless mini-split systems aren’t right for every household, but here’s a few quick guides to see if they fit your specific needs. Posted in Air Conditioning | Comments Off on Are Ductless Mini-Split Systems Right for Me? Is a Ductless Mini-Split a Good Option for Heating? That depends entirely on what you’re looking for. Ductless mini-split systems have a few pretty good advantages over more traditional systems, but they also aren’t a one-size-fits-all solution. Read on to find out if a ductless mini-split is right for you. Unlike a lot of other heating systems, ductless mini-splits are installed on an outer wall. The outside part of the unit absorbs thermal energy from the surrounding air, while the inside unit circulates warm air into the room. Essentially, ductless mini-splits are heat pumps. The difference between them and other heat pumps is their lack of ductwork to distribute air. A ductless unit will only heat the room that it is currently installed in. The first advantage you should know about ductless mini-splits is that they are remarkably energy efficient. The unit only has to heat one room, so it doesn’t have to waste a great deal of energy heating up the rest of the house before reaching the target temperature. This can save a lot of money on heating bills. By eschewing ducts, the ductless system also avoids losing any of its heat in transit from the unit to the room. Duct systems lose between 20 and 30% of their heat on average to duct leaks, so avoiding that issue is a significant advantage. If you’re using multiple ductless systems in your house, you will have the unique ability to set different temperatures for each room. Each ductless mini-split is operated by its own thermostat, allowing each member of your house to set a temperature for their room that is most comfortable for them. The biggest strength of ductless systems is also their greatest weakness: you can only heat one room at a time per unit. If you have a smaller space you want heated, or you plan on using multiple units, this isn’t really a problem. For larger houses, though, it’s something you should consider. Ductless systems also tend to be very prominent, needing a lot of wall space for installation. Some may find this an eyesore. If you’re looking for someone to install a ductless mini-split system for you, call A–Professional Heating and Air Conditioning. We install heating systems throughout Ponchatoula, LA. Posted in Heating | Comments Off on Is a Ductless Mini-Split a Good Option for Heating? If you are considering new air conditioning installation this fall to prepare for summer, you have more options than you once did. 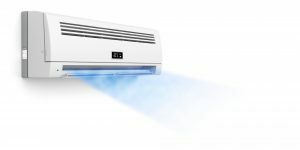 Over the last decade, ductless mini splits have made the transition from the commercial world (they’re popular in restaurants and hotels) into the residential world. Ductless systems have some important advantages that may tilt your choice for air conditioning installation in Hammond, NJ in their favor. You will need advice from air conditioning professionals to make the best choice for your new AC. Call A–Professional Heating and Air Conditioning and speak to our comfort specialists about the options available for cooling your home this summer. A ductless mini split heat pump works the same way that standard heat pumps do: using the circulation of refrigerant between indoor and outdoor units to move heat from one place to another. The difference with a ductless mini split is that instead of a single indoor unit connected to a ventilation system, they use multiple smaller blower units mounted in various rooms. Each blower has its own coil, and connects through the back of the wall to the outdoor unit. No ducts! This sounds obvious, but consider the sort of problems that ducts can cause your air conditioning. Ductwork gather dirt, dust, and even less pleasant contaminants, which then blow out into your home, lowering the air quality and dirtying the space. Dirt also impedes airflow and makes the system strain harder. You need to schedule regular cleaning to make sure the ducts remain dirt-free. Any breaks in the ductwork require repairs or else the AC will lose air pressure. Ductless systems have none of these issues. Zone control saves money! The individual blowers of a ductless system allow you to control the temperature in rooms separate from each other. You no longer have to cool down the whole house when you turn on the AC, only the places that require it. You’ll see a drop in your power bills when you only need to keep the air conditioning running in the spots of the house that need it. Heating and cooling! Although we’ve focused specifically on cooling down your home in this post (summer is coming up, after all), a ductless mini split heat pump has the same advantage that all heat pumps have: they work as air conditioners and heaters. Their heating power is far more efficient than that of fuel-burning systems like furnaces and boilers—another way you’ll save money. Ductless mini splits are not the ideal comfort solution for all homes. If you already have ducts in your house, you may consider installing a standard heat pump. However, for new construction projects and add-on rooms, ductless systems are great options. Call A–Professional Heating and Air Conditioning to schedule an appointment regarding your new air conditioning installation in Hammond, LA. Ductless or not, we’ll make sure you end up with the right cooling for the summer.